Yes! hear ye! hear me! This is your chance to own a tablet to be given away of course for free! courtesy of Andrew! This tablet once you get your hands into it’ll punch you in the face like nothing has happened! 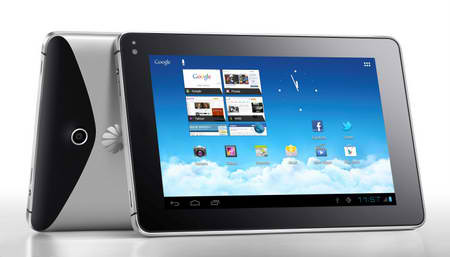 the tablet measures 7 inches in size, running on Android – Ice Cream Sandwich! yummy indeed! keeps you salivating for more, and what’s more it’s made by Huawei – the largest telecommunications equipment maker. Drool over these mouth watering specs to get started! go! Want to grab the nifty gadget? It’s all right here on Andrew’s Blog. When odds are not favoring on your side don’t worry – you’ll be able to hold on Globe Tattoo MediaPad for dear life at affordable price of Php10,990 Pesos thru Tattoo Personalized Plan that includes unlimited internet with blistering speeds of 7.2 mbps. As of the moment I don’t have a tablet to carry around in my line of work that’s why I need the Tattoo MediaPad to check on web updates.